Our gallery Am Kupfergraben 10, Berlin, was built after an international competition, initiated by Céline, Aeneas and Heiner Bastian and won by David Chipperfield Architects. 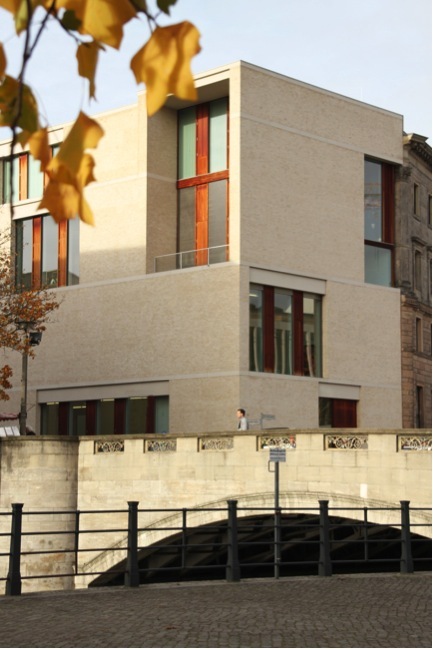 Haus Bastian is located on the Kupfergraben canal, overlooking the Museum Island and the Lustgarten. The gallery opened in 2007 with an inaugural exhibition by British artist Damien Hirst. The building is a modern interpretation of architecture – reacting to its immediate historic context; incorporating the past without replicating it. Haus Bastian was designed as an exhibition space and is directly related to the cultural heart of the city. We shall stage exhibitions in our building until March 2019. On 28 September 2017 the Bastian family announced their donation of the gallery building to the Stiftung Preußischer Kulturbesitz. With the intention to serve as a Centre for Cultural Education in the future, the building will be named »Haus Bastian der Staatlichen Museen zu Berlin – Preußischer Kulturbesitz«.